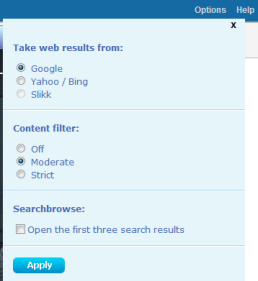 This entry was posted in instructional design approaches, search engine visualization, search engines and tagged new search engines, search browsing, search engines, search strategies, Slikk, web2.0 research. Bookmark the permalink. Hi Dianne, thanks for the great review! Two points: the “my” icon (which stands for “MySlikk” creates a collection for you stored at myslikk.com. Once you’ve chosen one of the options under the icon, a MySlikk link should appear right above the “my” icon, which takes you straight to your myslikk.com collection. Please do let us know if it’s not working for you! Also, the links which “MyLinks” allows you to add are simple navigational links, not buttons which focus your search (although that is one of the features we are currently working on adding!). We had several beta users who complained that they didn’t have an easy way to get to their gmail etc, so we added the “MyLinks” feature. 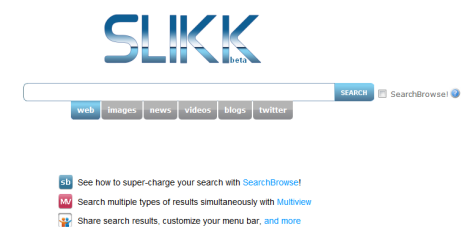 Note that once you add links, they also become available from the Slikk homepage! Let us know if you have any other comments or feedback! Thanks for the info, Feivi. 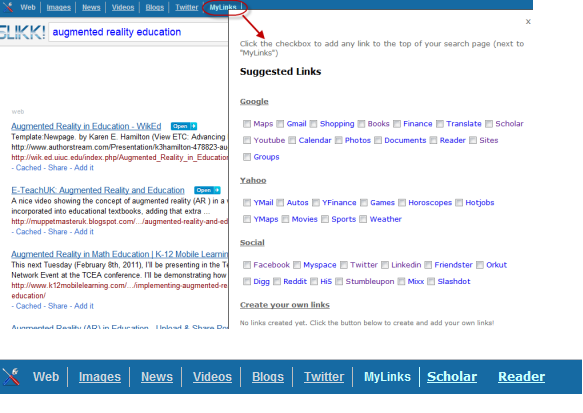 Updated the article re: the MyLinks feature. Still having a bit of trouble with MySlikk, but odds are it’s just something I’m missing.